In this seven-episode volume you will encounter Jesus, the Master Teacher, interacting with the scribes of the law. You will examine stories He told in their context; you will travel to Caesarea Philippi and discover why Jesus brought the disciples here to reveal that He was the Messiah. You will go to Bethany where He performed His greatest miracle and understand its meaning for life today. Explore Jesus' rich teachings in their first-century setting, and discover hope and purpose that will enrich your life in the 21st century. Filmed entirely on location in high definition, "Tracing the Footsteps of Jesus" will enable you to "come and see" Jesus' world and ministry as an eyewitness. Each episode is filmed where the stories took place and is illustrated with stunning scenery and realistic paintings from the great classical artists of the ages. Since his Damascus Road–like conversion at a Rolling Stones concert in Charlotte, North Carolina, in 1972, Tony has been a devoted follower of Jesus. As a serious student of the Scriptures, he has served in several teaching and pastoral positions. In 1986, he developed an interest in understanding the world and culture of the Bible. This soon became a passion, leading him to spend significant time in this fascinating part of the world to better understand the historical setting of the Biblical story. Tony has walked many of the ancient roads Jesus and the apostles walked, climbed numerous Biblical mountains, and visited most of the cities mentioned in Scripture. 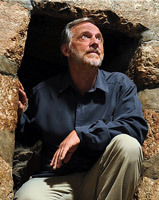 Through the years he has developed a unique teaching style, blending the Biblical text with the historical and cultural background of the story, which brings the text to life. For the past three-and-a-half years Tony has focused on the Jesus story, spending over seven months in "the land" filming this series. Now he invites you to "come and see" where Jesus was born and grew up, lived and taught, and was crucified and resurrected from the dead.